Source: SPARK/ The large size annual US-ROK war exercise started on March 1. The SPARK (Solidarity for Peace And Reunification of Korea) said. 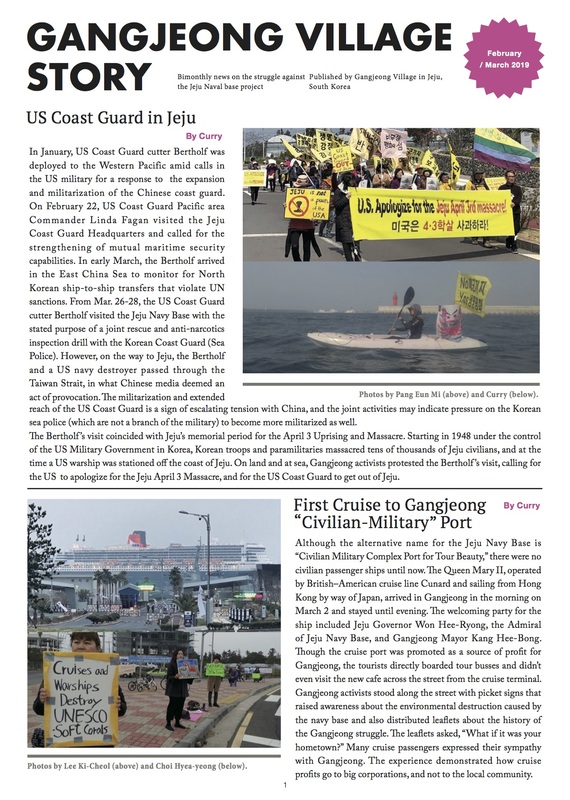 The U.S.-ROK “Key Resolve” and “Foal Eagle” annual war games, usually staged in March, and “Ulchi Freedom Guardian” in August, typically last for months and involve tens of thousands of U.S. troops stationed in South Korea and deployed from the United States, as well as hundreds of thousands of their ROK counterparts. U.S. Army, Navy, Air Force, Marine, and Space Command forces will participate in these exercises and practice scenarios including the removal of North Korea’s leadership, occupation of Pyeongyang, and reunification of the peninsula under U.S. and South Korean control. We call upon the U.S. and South Korean governments to stop the costly and provocative war games and take proactive steps to deescalate the current tensions on the Korean peninsula. In the past five years, hard-won efforts by the Korean people to ease North-South tensions have been reversed. Through its massive military buildup across the region, the United States has amplified regional tensions. Recent years have been witness to North Korea’s nuclear and missile tests, increasing nationalism and militarism in Japan (the world’s sixth greatest military spender), and a host of increasingly militarized territorial disputes. The global Cold War may have ended 20 years ago, but as the recent round of U.S.-led sanctions on the DPRK and threat of a third DPRK nuclear weapons “test” illustrate, the anachronism remains alive and well on the Korean peninsula. Crisis on the Korean peninsula furnishes a rationale for U.S. militarization of the region, and the Pentagon has committed to deploy 60% of its air and naval forces to Asia and the Pacific to reinforce its air sea battle doctrine. Announced as the “pivot” of U.S. military resources to Asia and the Pacific, President Obama’s policy, which necessitates more training areas, runways, ports of call, and barracks for the massive shift of U.S. military forces, disregards the impact of militarization on the lives of ordinary people in the region. The disastrous ecological and human costs of this “pivot” are acutely apparent in the current construction of a naval base on Jeju, an “island of peace” in South Korea known for having the planet’s densest concentration of UNESCO World Heritage Sites. Once celebrated for its pristine beauty and sea-based culture, Gangjeong, a 450-year-old fishing and farming village is being torn to shreds by the South Korean government in collaboration with the United States, which can freely use any ROK military installation. Base construction crews are dredging acres of world-class, bio-diverse coral habitats and covering them with concrete. The obliteration of these coastal ecosystems also destroys the millennia-old livelihoods of the villagers, 94% of whom voted against the base in a local referendum. Gangjeong villagers are watching their heritage, economy, vibrant local culture, spiritual center, and very core of their identity collapse into rubble. This same multi-facted people’s struggle is being played out in many places across the Asia-Pacific. Within President Obama’s “pivot” policy, U.S. bases in South Korea, Japan, Okinawa, Hawaii, and Guam are ever more important. Moreover, his administration has been pressing hard to open up previously closed U.S. bases in geostrategically vital nations such as Vietnam and the Philippines. This year marks the 60th anniversary of the July 27, 1953 Armistice Agreement that brought the combat phase of the Korean War to a temporary halt but did not end the war. The Armistice Agreement stipulated that a peace agreement be realized within three months and that negotiations take place for the withdrawal of all foreign forces from Korea. Over the past several decades, North Korea, often portrayed in mainstream media as an irrational rogue state, has repeatedly requested peace negotiations with the United States. Yet today, we station nearly 30,000 military personnel and operate over 40 military bases on the Korean peninsula. We have spent the past 60 years living not in a post-war era, but under a ceasefire whose consequences are borne most acutely by the Korean people. On this anniversary of the irresolution of the Korean War, the longest conflict the United States has been involved in, we as human rights, Korean solidarity, faith-based, peace, and environmental organizations call for attention to the human and ecological costs of permanent war as the modus vivendi of U.S.-Korean relations. Efforts that promote increased militarization and conflict and the destruction of the rich biodiversity in Korea are immoral and go against universally shared values of building peace, caring for Earth, and respecting the human dignity and worth of every person. 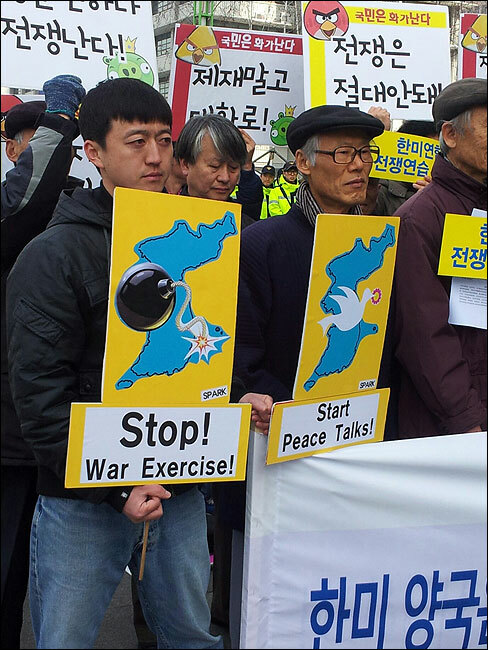 We, the undersigned peace, human rights, faith-based, environmental, and Korean solidarity activists, call upon the U.S.-ROK governments to cancel their dangerous and costly war games against North Korea. We strongly urge the United States to turn to diplomacy for common and human security rather than militarization, which will only undermine regional and U.S. security. We further request that the Obama administration focus its strategic shift to the Asia region on finding diplomatic and peaceful solutions to conflict, and building cooperation with all nations in the region, including China, DPRK, and Russia. On this anniversary of the 60th anniversary of the signing of the Armistice Agreement, which several decades ago called for a peaceful resolution to the Korean War, we join with our peace-minded brothers and sisters in Korea and call on the Obama administration to deescalate the current tensions and do its part in realizing “Year One of Peace” on the Korean Peninsula.